Forget everything you thought you knew about Mercedes-Benz, because the 2018 Mercedes X-Class is the most important thing to happen to the German brand in decades. I’d go as far as to say that this is up there with the original ML SUV for the Three-Pointed Star – because the X-Class will change the way people think about the company. And, quite literally, the way they see it. Obviously there’s a history with Mercedes-Benz vans, one that has been successful in Europe, and Australia to a degree. And while the X-Class will fall under the vans banner by way of the company hierarchy, local sales and distribution will happen in the commercial vehicle dealerships and passenger-car showrooms, too. And with buyers flocking to dual-cab utes, wouldn’t one of these just look the part parked next to a C- or E-Class in your driveway? You wouldn’t be looking at a Mercedes-Benz if you wanted a bargain offering in any other segment, so why would expect to see such a thing in the ute market? So, how much does it cost? Here’s a guide of specifications and a price list for each of the different models across the price range - and be prepared, because like most pick-up models, the X-Class range has a lot of variants on offer. The range is opened by the Pure variant, which is pretty sparsely equipped, but aimed at workers on farms and tradies (and don't they love a Benz badge). The entry-level Pure spec is aimed at farmers and tradies. It is visually defined by black-grained bumpers and 17-inch steel wheels, but it still gets power-adjustable side mirrors. You get halogen headlights and tail-lights in this spec. On the inside there’s piano black vent surrounds, black 'Tunja' fabric trim, plastic floor covering, air-conditioning, cruise control, a plastic steering wheel and gear selector, tyre pressure monitoring, and a 7.0-inch Audio 20 CD multimedia system with Bluetooth phone and audio streaming, USB connectivity and four speakers. It has a reversing camera for the pick-up only - the cab-chassis doesn’t have one. You can get the Pure model with the choice of two drivetrains at launch, the X220d and the X250d - more on those below. The entry point to the range is the Pure cab-chassis rear-wheel drive manual, at $45,450 (all prices plus on-road costs). You can have it as a RWD manual pick-up at $46,400, or as a manual with 4Matic four-wheel drive for $50,400. The X250d Pure 4Matic starts off at $51,450 for the manual cab-chassis and you’ll need to add $2900 for the auto ($54,350). The X250d Pure 4Matic pick-up manual is $52,400, with the auto costing $55,300. There are a bunch of different optional packs available depending on the trim level - read the Mercedes-Benz X-Class 2018 pricing and specs story for more info. The progressive has body-coloured bumpers and 17-inch alloy wheels. The next model up is the Progressive, which is visually determined by its body-coloured bumpers with black trim at the front and 17-inch alloy wheels. It also gets heated side mirrors, a heat-insulated windscreen, rain-sensing wipers, carpet on the floor, a black-grained instrument panel, silver air vent trims, black 'Posadas' fabric upholstery, a leather-wrapped steering wheel, gear shifter and handbrake lever, aluminium sill protectors, an eight-speaker sound system with DAB digital radio, a 7.0-inch media screen with Garmin satellite navigation, and an auto-dimming rearview mirror. The Progressive gains 'Posadas' fabric upholstery and a leather-wrapped steering wheel. The Progressive model is only sold with the X250d drivetrain, but can be had as a cab-chassis in manual ($53,950) or auto ($56,850) guise. If you prefer the pick-up body style, you’ll be spending $54,900 for the manual or $57,800 for the auto. The flagship model in the range is the Power, which scores chrome-accented bumpers and 18-inch alloy wheels to set it apart from the pack, plus LED headlights and tail-lights. The flagship model is the Power, with chrome trim and 18-inch alloy wheels. Other Power goodies include... er... power-folding side mirrors, 'Artico' (fake leather)-trimmed instrument panel with contrast stitching, Artico and 'Dinamica' (microsuede) seat trim, an 8.4-inch 'Comand Online' multimedia system, power front seats with lumbar support, a 360-degree camera system, semi-automated park assist, dual-zone climate control and keyless entry/start. The Power model can only be had as a pick-up, and the manual will set you back $61,600, while the auto is listed at $64,500. Inside the Power gains 'Artico' fake leather trim on the instrument panel and seats. So it isn’t absolutely loaded with the luxuries you’d find in some of the brand’s passenger cars, but there is some really good news in the safety equipment section below. 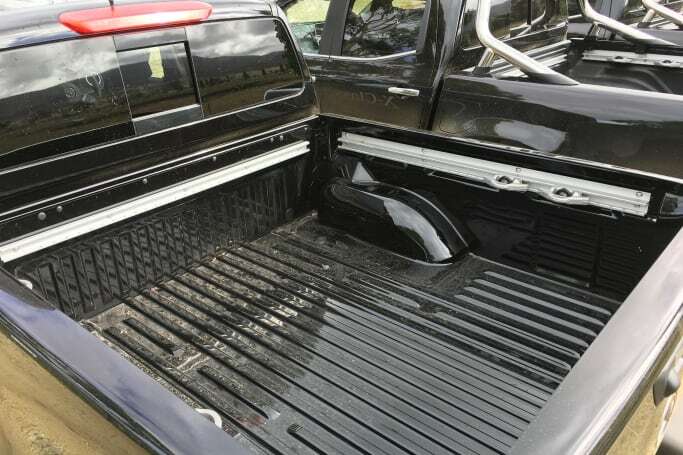 Before we get to that, let’s talk accessories for these models, because it’s worth considering that no model comes as standard with a bed liner/cargo liner to protect the tray (you can option one for $899), nor does any model have a soft tonneau cover ($1040) or a hard lid cover ($3020). A roller cover, which the Ford Ranger Wildtrak gets standard, will set you back $3295. Mercedes also offers not one, but three different types of canopy - the Sports Canopy with roof rails ($5609) or without ($5071), or a less streamlined Touring Canopy with opening windows ($4945). Prices include GST, factory colour-coded painting and fitment. As for choices of colours, there’s more than black and white. Just expect to pay extra if you want something from the rainbow. It doesn’t look much like a Nissan Navara, does it? Well, if you read our Facebook comments you might disagree with me, but Benz has hidden the skeleton of its first ute very well under a wider body, despite sharing the same ladder-frame chassis donated by the Japanese company’s ute under a collaboration between Mercedes-Benz and Renault-Nissan. Internet commenters are quick to point out the similarities between the X-Class and the Navara with which it shares a chassis. But, as a company rep said at the launch, “this is no badge-engineered model like the Renault Alaskan” - because it is wider at the front, at the rear, and in the middle. Yep, the entire body has been broadened, not just the guards. It really does have a more substantial look to it than many of the other utes in the segment; the wide tray and wider track than most combine for a fair bit of road presence, and that’s before you even see the big, proud Benz badge at the front. The X-Class is wider at the front, rear and middle than the Navara. When the Concept X-Class models came out, everyone was hoping that’s what we’d see in terms of design. But even though the production model is undeniably more sedate than the show-cars were, it looks good in the metal. The rear-end’s long, the slim tail-lights are very attractive, and I even like the look of the entry-level Pure model, with its black plastic front bar and halogen headlights… but the high-end Power spec I was primarily driving at the launch - with its LED headlights and chrome exterior highlights - is probably the one I’d want. Shame there’s no AMG body kit, or even a hardtop for the tray as standard on the high spec. The actual body of the ute is 50mm wider, which should mean more space on offer in the interior, and while it mightn’t sound like much, I’ll tell you more about that in the next section. 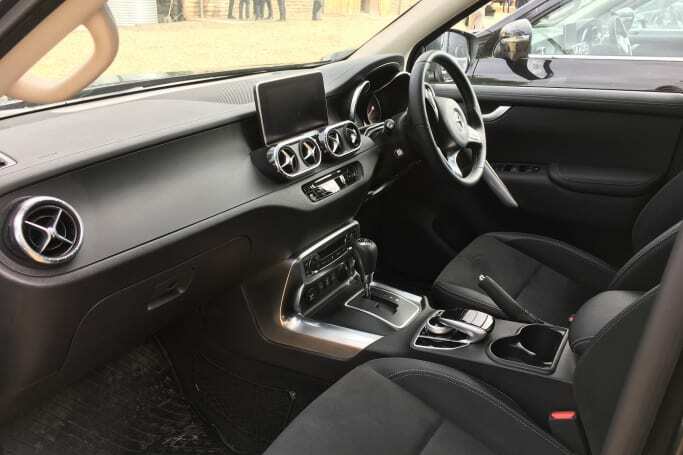 It’s simple - the cabin of the X-Class is better if you spend more money. The high-spec models get a nicer cabin trim, and the entry-grade version is, frankly, quite cheap feeling. 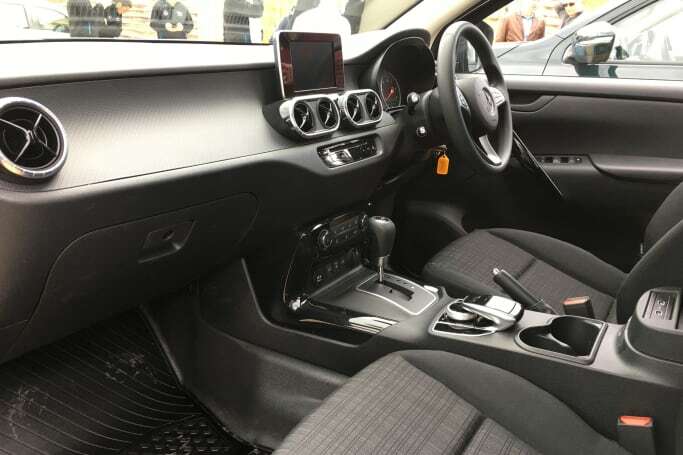 The Pure version has a plastic steering wheel, rubber floors, and a plastic gear selector, and while the cloth seats were fine, the centre console in the test vehicle I briefly drove had no lid - just two exposed USB ports. It looks unfinished. The Pure version I briefly drove had no lid, just two exposed USB ports. Of course there are a lot of hard plastics, but it’s a work ute first and foremost. But in the Progressive and Power models, you get a leather-lined steering wheel and gear selector and carpet on the floors. These models feel more premium, instantly. Even better is the Power model, which sees the addition of (fake) leather and microfibre seat trim, plus keyless entry (even if it does have a Nissan key fob rather than a Benz one) and dual-zone climate control (again, from the Nissan parts bin). The bigger media screen adds to the ambience, too - it’s an 8.4-inch infotainment unit, which Benz claims is the biggest in the class… obviously they don’t consider the LDV T60 a class competitor, as that affordable Chinese ute has a 10.0-inch screen with Apple CarPlay (which isn’t available on any X-Class). Cabin ambience is much better the more expensive you go. Benz also claim the 8.4-inch touchscreen is the largest in the segment. If you want, you can get a black roof-liner rather than the ‘cappuccino’ beige finish fitted standard (that’ll cost you $400), plus you can change the look of the dashboard by specifying aluminium ($170) or wood trim ($420), and there’s also the choice of full leather seat trim in black or brown ($1750). I’ve gotta say, the brown leather seats with the beige headliner and the wood trimming looks very good. 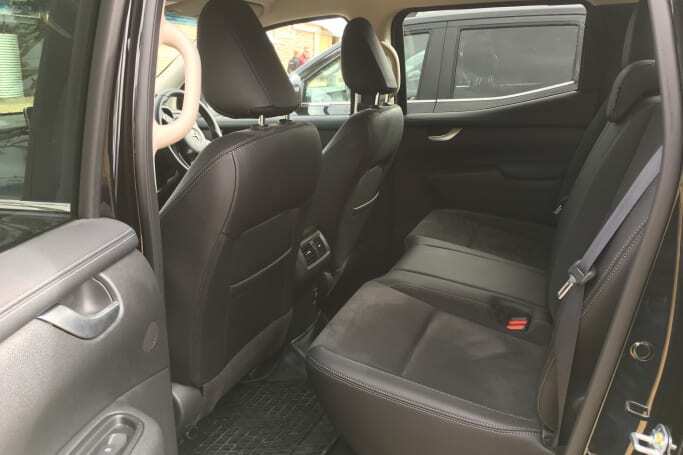 Now to the space: the front seat offers good room and comfort for occupants, and there are bottle holders in the doors, plus a small covered console bin between the seats (in the Progressive and Power models). 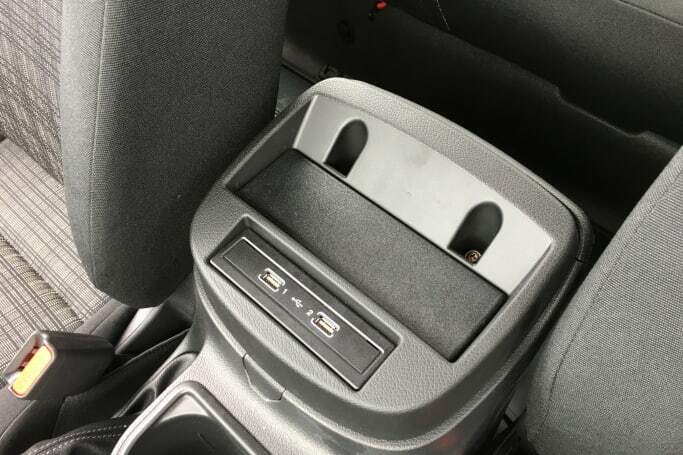 The cupholders between the front seats are small and shallow - not really suitable for the Large Soy Caramel Latte Takeaway crowd, and there’s bugger-all loose item storage in front of the shifter, either. There is a sunglass holder in the higher-spec models, however. In the rear there’s not much going on - door pockets that’ll hold a bottle each, but no cupholders to speak of. Map pockets feature, but there’s no centre armrest. All models get a 12-volt outlet in the back, plus two up front (and a fourth in the tub if you choose a pick-up). Back-seat space is okay, but not terrific. Those who stand around six-foot (183cm) like myself will find it cramped in the rear, with limited headroom, knee room and toe room. It’s not a knees-hard-up-against-the-seat-in-front position, but it’s not far off. The seat base is quite high, so I found myself stooping a little to see out the window - but kids will be very well catered to. There are dual ISOFIX baby seat attachment points, and three top-tether loops for child-seat fitment, too. Back-seat space is okay but not terrific, taller people will feel cramped in the rear. And yes, the extra width that Benz has built into the body does make a very small difference if you want to squeeze three people across the back. But it still doesn’t feel as spacious as an Amarok for width. 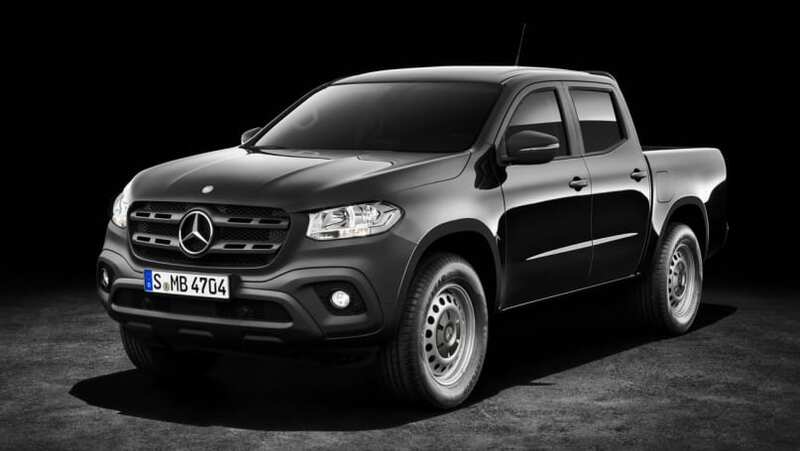 At the time of writing, Mercedes-Benz has stated that it is only going to sell the dual-cab version of the X-Class, but a single cab is available in other markets, and could be sold here at a later date. There is no extra-cab/space-cab model. As for the tray, the internal measurements are 1581mm long (the lengthiest in the class), 1560mm wide (with a 1215mm gap between the wheel arches - wide enough for an Australian pallet). The tray depth is 475mm. The tray measures at 1581mm long, 1560mm wide, and depth is 475mm. Mercedes-Benz claims every X-Class has a payload of more than one tonne/1000kg, and here’s how they stack up (without options boxes ticked): the X220d manual model is rated at 1067kg; the X250d manual is rated at 1037kg; and the X250d auto is rated at 1016kg. Let’s talk about specs - engine specs, to be precise. At launch the X-Class comes with a pair of engines you can get in the Navara – both of them have a 2.3-litre four-cylinder diesel engine as the basis. The entry-level X220d model is offered in Pure spec only, and it uses a single turbocharger to produce 120kW of power and 403Nm of torque. You can get it with a six-speed manual gearbox only, but in rear or 4Matic four-wheel drive. The next model up the horsepower scale is the X250d, which uses a twin-turbo version of the 2.3-litre engine and has 140kW and 450Nm. It is available in 4Matic four-wheel drive with the choice of a six-speed manual or seven-speed automatic. There’ll be a 3.0-litre V6 turbo diesel known as the X350d, which will land here with 190kW/550Nm - this time with 4Matic permanent all-wheel drive, but with a low-range transfer case to separate it from the Volkswagen Amarok (which has permanent AWD but no low-range). It gets here towards the end of 2018, and we’re sure it’ll have a lot of appeal with cashed-up buyers… because it’s going to be expensive. But it’ll have things like paddleshifters and a drive-mode-selection system to help justify the cost. And while we know the X350d will be the fastest in terms of 0-100km/h acceleration (no exact performance figures are available yet for it), the X250d 4WD claims 11.8 seconds from 0-100km/h. The X220d 4WD claims 12.9sec, and the X220d RWD is a little faster, at 12.5sec. There is no petrol X Class model available. 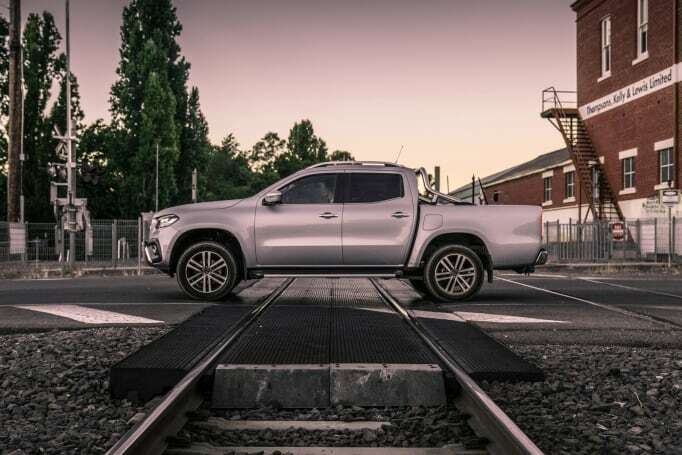 While there was no chance to test the towing capability of the X-Class at the launch, Benz claims towing capacity of 3.5 tonnes for a braked trailer for the 4x4 model. The 4x2 is weight rated at 3.2 tonnes, while both have an un-braked trailer limit of 750kg. The X220d has claimed fuel use rated at 7.4 litres per 100 kilometres, and as far as we can tell, that’s for both the rear and four-wheel drive models. It’s one of the more efficient vehicles in the class. The X250d has claimed fuel consumption of 7.9L/100km whether you choose manual or auto, which - again - is good for the class. We don’t know the exact figure for the X350d V6 model, but expect it to be around the 9.0L/100km mark. 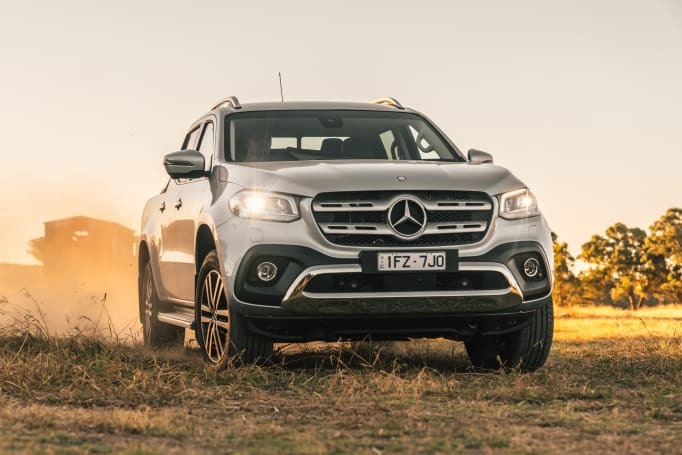 The X-Class has received the highest accolade in terms of a crash-test rating - it scored the maximum five-star rating when it was tested in 2017, and as Benz was at pains to remind us, that makes it the only ute under the current, stricter criteria to have managed such a score. What has it got, then? Well, every X-Class has seven airbags, including dual front, driver’s knee, front side and full-length curtain airbags - something the other German-badged ute in the segment can’t claim. 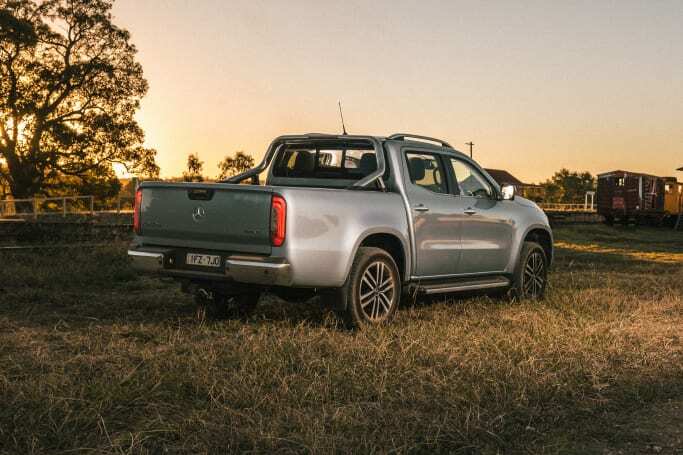 Plus the X-Class has something that no other ute brand can brag about - auto emergency braking (AEB) is standard across all models in the range. The next best offer in the ute segment in that regard is the Ford Ranger, which has a tech pack only fitted standard on the flagship Wildtrak (optional on FX4 and XLT models) with forward-collision warning but no auto braking. 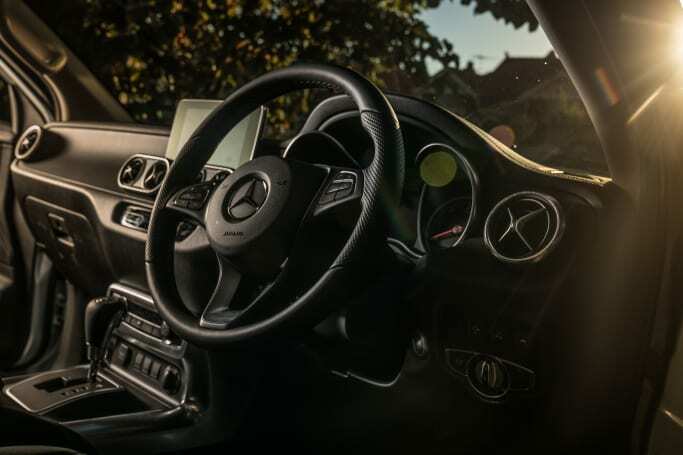 The Benz system also includes lane-keeping assist, a system that buzzes the steering wheel to warn you if you’re colouring outside the lines. The Ford does, however, have adaptive cruise control included as part of the tech pack, where the Mercedes doesn’t have that on any model, even as an option. But cruise control its standard on all variants. One thing to consider if you want a cab-chassis model is that there is no standard-fit reversing camera, and Benz doesn’t offer one as an accessory, either. Plus, only the Power has standard parking sensors all around, so you’ll need to option them on the Pure or Progressive grades if you want them. Where is the X-Class built? Barcelona, Spain, where the Navara is also built for European markets. 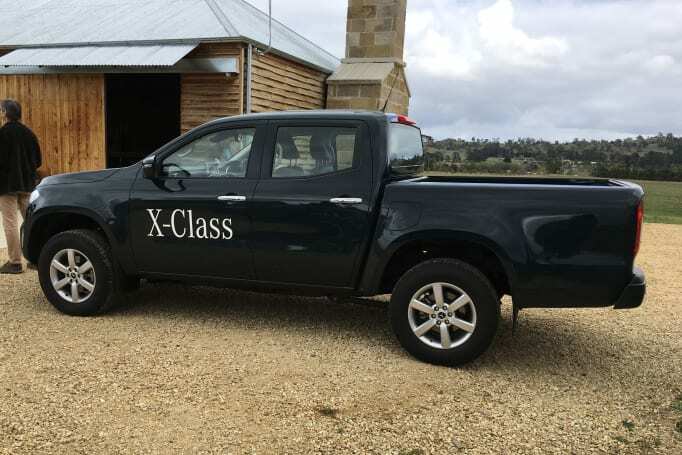 The new X-Class ute will launch with a three-year service deal known as 'ServiceCare Promise. Maintenance' is due every 12 months or 20,000km - whichever occurs soonest - and buyers will also get included roadside assist and a three-year/unlimited-kilometre warranty. As for the cost? Benz says ServiceCare Promise will see the first visit to the workshop set at $585, while the second will be $930, and the third $835. That total - $2350 over three years/60,000km - may seem steep, but Benz reckons it’s “only $162 per service more than the Navara”. But it’s still expensive when you consider it against competitor utes. If you don’t do big kilometres, then it’ll be more affordable to own an Amarok, Ranger, HiLux, Triton or Colorado, to name a few. However, if you pre-purchase the ServiceCare Promise plan, you get a $500 discount - making it $1850 for three years/60,000km of servicing. The X-Class certainly forges its own character in terms of the way it drives, with a fairly impressive experience offered up at the wheel. Is it as good as I was expecting? Not quite. But is it better than most of the other utes in the segment? Certainly, it has probably two-thirds of the dual-cab pack shaded. Where does it fall short? Steering is the first point. There’s a certain slowness when you start to turn the wheel as you’re entering a corner that doesn’t quite live up to what we know from other Benz products - even the Sprinter and Vito vans - and the turning circle is huge, at 13.4m (that's what happens when you widen the track!). The company has quickened the steering rack compared to the Navara, but it needs to be quicker again to live up to the handling that it’s capable of. I say that because it holds a great line through twisty stuff: you mightn’t plan to exploit that in day-to-day driving, but it’s nice to know that if the right stretch of road comes up, you won’t be left floundering with a wobbly, truck-like ute experience. No, the X-Class - with its double wishbone front suspension and five-link coil spring rear suspension setup, offers road manners better than some of the ute-based SUVs out there. However, on the 19-inch wheels that come as part of the 'Style Package' ($2490 - includes a power rear window, tinted back glass, side steps and roof rails), the ride was more unsettled than expected. Over country back roads it was somewhat jittery, picking up bumps the eye couldn’t see. So, if you’re expecting an S-Class ride, you might need to reconsider your parameters a little bit. But on first impression it certainly seems less choppy than some of the more affordable utes it fights against… and remember, it is a ute. The four-cylinder engine in our test car was of the twin-turbo X250d variety, and combined with the seven-speed automatic transmission it did a commendable job. This drivetrain is the pick in the Navara range, and it is in the X-Class line-up … for now. With the X350d coming late in 2018, I’d be tempted to hold out. I’m not saying the X250d is bad - not by any stretch of the imagination. It’s a great drivetrain: smooth and refined at low speeds, with enough grunt to get things moving a little faster if that’s what’s called for. The seven-speed auto has been worked a little by Benz, too, and it offers a crisper shift feel without as much flaring between ratios. While our video doesn’t show it, we did manage to get a little bit of time in the X-Class off-road, with a stint crossing a bunch of paddocks of Tasmanian farmland. It wasn’t rock-hopping stuff, but we did get to test out the approach angle (30 degrees) up a steep slippery incline, plus the departure angle (25 degrees) seemed adequate, especially given the tray of the X-Class is the longest in the class. Another number to throw at you is the ground clearance in millimetres - 221 of them, in fact - which isn’t the best in class, and we touched down once or twice off-road. But the biggest factor limiting the progress of the X-Class during this very short muddy tour of Tassie was the tyres - our test vehicle was riding on 19-inch alloys with Bridgestone Dueler 255/55 highway rubber, and we found the limit of the tyres well before the limits of the chassis itself. 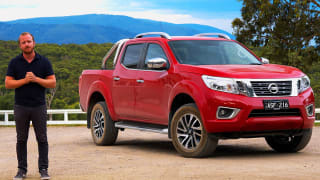 It employs the same switch-on-the-fly 4WD system as the Navara with a 4x2 (2H) mode being the default setting you’ll run around in day to day, a 4x4 (4H) high-range setting for gravel roads and rougher high-speed tracks, and a 4L low-range setting for slower crawling. If you’re in 4H, the hill-descent control will work at 8km/h, while 4L will lower that speed to 5km/h. It’s a relatively refined system, but it needs grip to work best - at one stage we descended a slope and the system didn’t reign the ute in as quickly as we would have liked due to a lack of traction. If the going gets really tough - as it did for us at one point, as we attempted to squirrel our way up a hill at too slow a pace - the rear diff lock, which is standard on all 4WD models, definitely comes in handy. I also learnt at that stage that the hill-descent system also works in reverse, at the same speeds mentioned above, and the surround-view camera (also known as a 360 degree camera) was invaluable in that instance. What was a bit annoying was the fact the front and rear parking sensors (standard on Power, optional on all other variants) couldn’t be properly disabled. You turn them off, and they only stay disabled for about 10 seconds. Of course, if off-roading doesn't matter to you, then perhaps consider the Pure model, which is available with the base engine tune and manual transmission in rear-wheel drive. 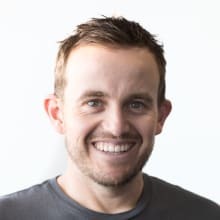 There is no RWD auto available. There was no towing at launch, but there was a chance to see what it was like with a load on board. In the back of a Pure X250d auto was 650 kilograms of pre-mix concrete bags… a pallet’s worth, in fact, because the X-Class can fit a standard Aussie pallet between its arches, unlike pretty much all the other utes in the segment (except the Amarok). It drove quite well with the weight in the tray, dealing better with the fidgety bumps that upset the back-end when empty. And while there was some droop to the rear coil spring suspension, it wasn’t bouncy or wobbly, with the extra thick stabiliser bar Benz has used in the back adding a level of surety to the way it changed direction when working with weight. Does the Mercedes-Benz X-Class ute move the game on? No, it doesn’t. But what it does do is offer yet another quality vehicle in the highly competitive dual cab ute segment, one that could be very compelling to existing Benz owners looking to get rid of a different brand of ute on their driveway. And as when the ML came out, the X-Class does some things that should make the competitors sit up and take notice - particularly on the safety front. It mightn’t see the same sales success as an SUV, but there is no doubting it will help change perceptions about the brand. I can't wait to drive it against some competitors in the real world to see how it shapes up. Still, if it were my money, I'd be holding out for the V6, and I'd probably be having it in the top-spec Power guise. Is the Mercedes-Benz X-Class the sort of ute that you'd consider? Let us know in the comments section below.